Ski season is just around the corner. With Whistler Blackcomb set to open on November 27th, it’s time to plan your snow season vacations and your mountain dining. Let me tell you about a Whistler gem called Alta Bistro, that you absolutely must get to. 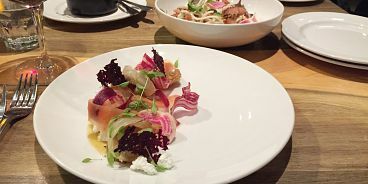 The ingredients at this cozy restaurant, nestled beside the Pinnacle Hotel, are local and ethically sourced by Alta’s independent owners who love to support their neighbouring farmers. Even a handful of their spirits come from nearby Pemberton Distillery. The only beer on their menu is from Whistler Brewing — and it’s really good. General Manager and Wine director Eric Griffith does an excellent job building his menu. I highly recommend you request a personal wine pairing suggestion directly from him to heighten your dining experience. As for the food, Chef Nick Cassettari’s dishes are simply awe-inspiring, combining unusual flavours that always work, with loads of texture, colour and beauty to boot. View Alta’s current menu here.